A while back the lovely Luchessa at Beauty Expression by Luchessa sent me a surprise package filled with polishes 😀 Isn’t she the sweetest?! Among with other lovely polishes she sent me four textured polishes by P2. I’d like to show you the four shades that Luchessa has sent me plus a surprise at the end of this post. All swatches are with a base coat and two coats of color. illegal, a bright red base with gold and red glitter particles. lovesome, a bright pink base packed with gold and magenta glitter particles. seductive, a plum base packed with gold glitter particles. confidential, a denim blue base packed with gold, blue and purple glitter particles. Lovely ha! I love them all. The formula is fantastic and very easy to work with. Obviously they all dry to a matte textured finish with sparkle. You’ll need two coats for full opacity. The trick to really let the textured finish show off is to let the first coat dry thoroughly before applying the second one. The removal is a bit more difficult than a ‘regular’ polish but they’re not that stubborn as for example OPI’s and Zoya’s textured polishes. Luchessa is giving away three of these Sand Style polishes of your choice plus a Ultra rich hand serum with grape seed and evening primrose oil & permute extract. Luchessa really loves it. It has a great AEF vitamin complex that moisturizes your hands overnight. Who doesn’t want perfectly moisturized soft hands? This giveaway is (of course) open to everyone and ends on May 8th. Try your luck by entering this giveaway via the Rafflecopter link below. This entry was posted in Giveaway and tagged giveaway, p2 confidential, p2 hand serum, p2 illegal, p2 lovesome, p2 nagellack, p2 nail polish, p2 seductive, textured nail polish by Polish Alcoholic. Bookmark the permalink. 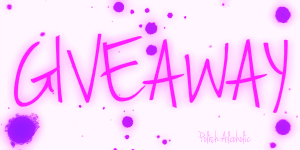 Hey, I am super duper excited about this giveaway. And the give away is textured nail paints :)I have been hunting for it these days. I have completed all entries 🙂 And it took me just 2 minutes (usually I get lazy and finish steps in days) but since I super liked it and I anyways follow you and Luchessa, it was a cake walk. 😀 YAY! Good luck to you hun! Another brand with textured polishes!? I need them all! Seductive looks particularly amazing!! 😀 lol! Yeah, they’re really everywhere! I’m intrigued by the hand serum! All those ladies who lusted after my P2 polishes… here is a chance to win some! These polishes are amazing (I have all of them except adorable!) ❤ What a great prize! 😀 Awesome! Thanks for the reblog!